Date : year-103 (156 to 157 BC). Size : 18.0 x 19.8 mm. Weight : 3.98 grams. Grade : XF, very bright metal. Obverse : Bee flying, with the date letters RG (year 103) in monogram form to the left, with what appears to be a AMC monogram to the right. 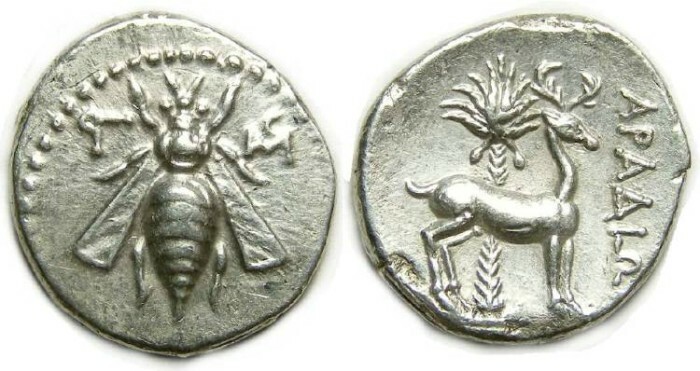 Reverse : Stag standing right, with ARADIW to the right. There are a couple of minor rough spots below the stag, which appear to be natural flan defects from when the coin was first struck.